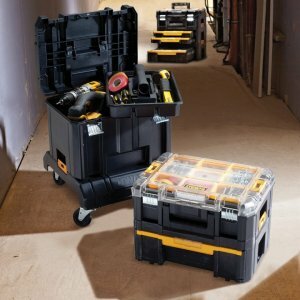 For a limited time Rockler has a 20% discount on the DeWalt TSTAK Tool Storage System. Use the coupon code (above) to get free shipping on your order. The DeWalt TSTAK Tool Storage System is a modular storage solution for tools or fasteners, which has been designed to be customizable to suit one’s needs. With 6 storage options and 2 cart options you are likely to find a solution to fit your needs.